Games for the Weekend is a weekly feature aimed at helping you avoid doing something constructive with your downtime. Each Friday we’ll be recommending a game for Mac, iPhone or iPad that we think is awesome. Here is one cool enough to keep you busy until Monday, at least. Trainyard ($2.99, Universal) is quite simply one of the best iOS(s AAPL) puzzle games out there. With a learning curve that is slow moving at first, once you get familiar with the gameplay and gain some momentum as an engineer, there is no stopping the runaway creativity that keeps this train a-movin’. In Trainyard, your goal is to lay down the track necessary to direct the train from start to finish without wrecking the train. Each train is color-coded and you need to match up the same colors at both the starting and ending points. To lay down the track, you drag your finger across a screen. There are no more than two pieces of track per square on the grid. Sounds easy enough, and in the beginning it is. Each train follows its track straight across the screen from its assigned color beginning point to the same color ending point. As the game progresses, the levels get harder — multiple trains start showing up, each with their own colors. Laying two tracks on any one square makes the tracks switch each time a train crosses that square’s track. You learn that carefully choosing which track is on top is important. And then it starts to get even more complicated: two trains can merge into one if you get the timing just right, and having two trains pass over each other changes their color. A yellow and a blue train crossing over one another creates two green trains, and so on across all of the primary and secondary colors. Merging a yellow and blue train hover will create one green train. This is important as each ending point will only accept so many trains of a certain color. Each level can of course be solved multiple ways. There is no one best solution. One of the coolest features of the game is that you can share your solutions with other players online. 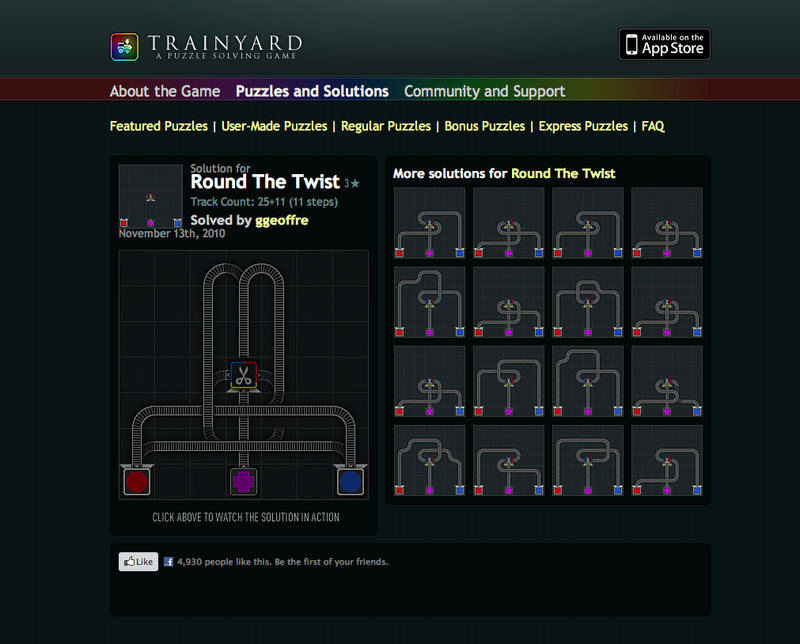 Sure the game supports the usual Twitter and Facebook(s FB) posts for completed leves, but there is also a website dedicated to the game where players post their solutions to each level. This little gem can even be utilized as a sort of cheat sheet for times when you really get stuck on solving a particular level. It is also interesting to see just how closely we all think alike when it comes to solving each level. There are over 1 million user-submitted solutions posted on the site to date. There are two versions of the game out there to choose from. 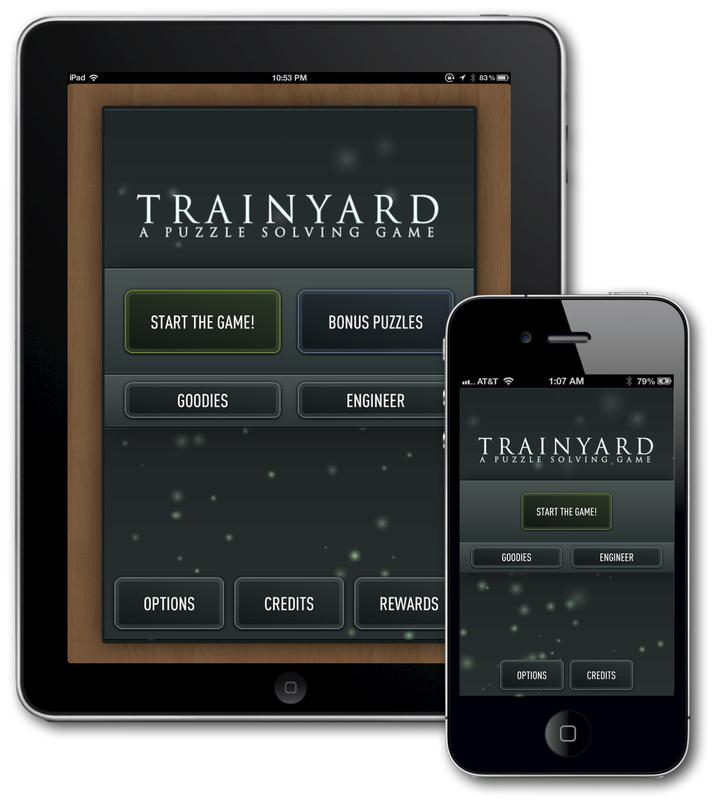 Trainyard, the original, comes with 100 normal levels and 50 additional bonus levels. Trainyard Express, the prequal, comes with 60 new levels to play. And to make the game infinitely expandable, you can play the role of engineer by creating and sharing your own levels online. There are already over 50,000 levels submitted by engineers all around the world. This makes it very unlikely that you will ever be able to finish every level out there over one weekend. If you do find yourself browsing the puzzles website for a unique and challenging level to play, just click on it in mobile Safari and it will automatically launch the game with the level you selected downloaded and ready to play. Trainyard is the type of iOS game that excels on all levels. You can play a level in a couple of minutes as you stand in line or wait for your business meeting to begin. It has been enhanced for Retina displays and yet the developer has taken the time to create a color-blind mode. And as you play you can share unique solutions and custom levels of your own creation with family and friends online. It is just the sort of game that will stay on your home screen for more than just a weekend or two for sure.